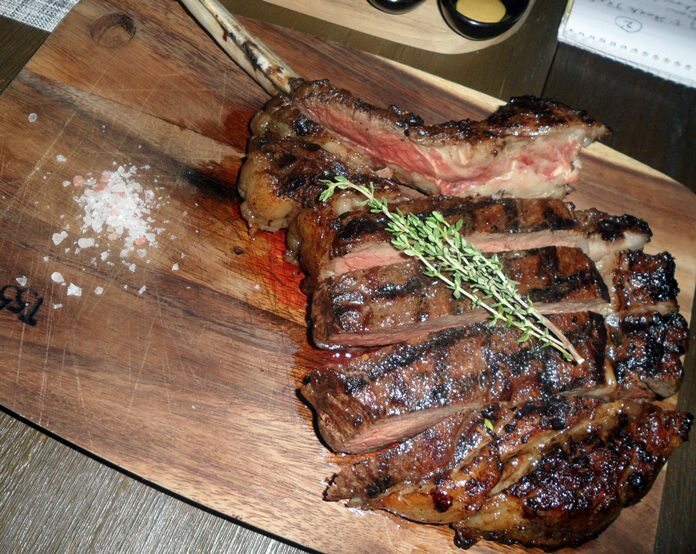 The awesome Charlolais tomahawk steak. Mövenpick Siam Hotel Na Jomtien is a newcomer to Pattaya, but is part of the world-wide Accor chain. However, the background to the Mövenpick brand includes, for me at least, Jonathan Livingston Seagull. The book, written by Richard Bach, explores that for seagulls, life consists simply of eating and surviving. Against the conventions of seagull society, Jonathan Livingstone Seagull seeks to find a higher purpose and become the best at doing ordinary things in an extraordinary way. Well, “Möven” in German is seagull, and when founder Ueli Prager was looking for the name for the hotel, Prager and his architect watched people throw bread at the gulls. “They were so hungry at the time that they pulled the bread out of our hands,” said Prager. That’s why the architect came up with the word Mövenpick. Wishing to emulate the seagull, Mövenpick wishes to do things in an extraordinary way as well, so when the PR lady K. Poo (much easier to pronounce than her real name Juttayapand Rojnchinnont) invited the Dining Out Team to come and review their new promotion, the T55 New York Grill, we naturally said yes. Mövenpick is in Najomtien and very easy to access. To get there (which is actually the easiest part of the whole exercise), head towards Sattahip on Sukhumvit Road, do a U-Turn at Ocean Marina and Mövenpick is about 200 meters along on the left. A long driveway gets you to the secure parking area. There is an elevator which will then take you up to the Lobby where a staffer will guide you to their T55 restaurant. As an aide memoire, the restaurant gets its name from T for Tenderloin, and 55 from the hotel’s house number. Having found the restaurant, you pass by an amazing “butchery” with all types of meat stored and aged for around 40 days. The carnivore’s heaven. The dining room overlooks the tropical gardens while the dedicated staff is everywhere, making sure everyone is being catered for. Opposite the “butchery” are the climate-controlled wine racks. The list is not extensive, but neither is it expensive, with most between B. 1,500 and 2,500 and the house wines B. 1,600 per bottle (Pinot Grigio white and an IGP Puglia red) eminently quaffable. Mention must be made of the exquisite cutlery, shiny and black gloss and the plates emblazoned with T55, just in case you forget where you are? The restaurant board menu has Appetizers generally around B. 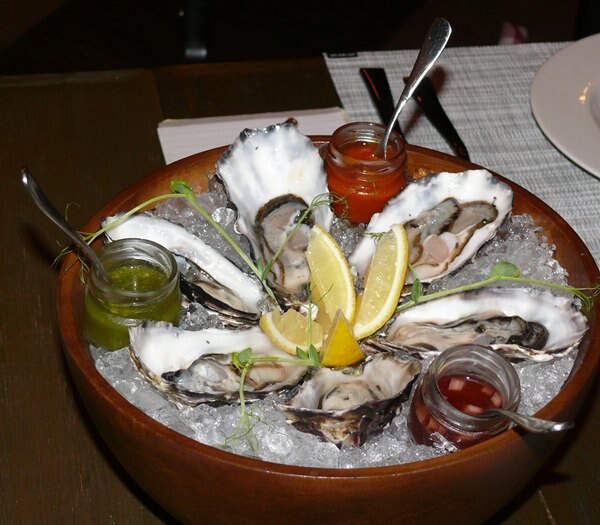 450 though the oysters (American) are more expensive at B. 800 for 6. 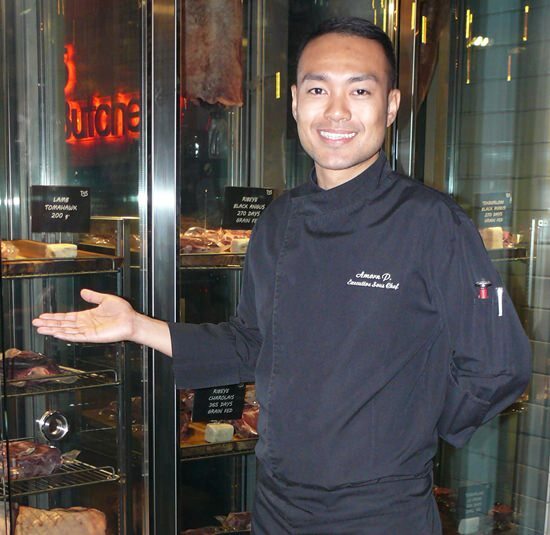 Chef Jacky with his butcher shop. Mains are in the B, 550 range and include ribs and pork knuckle while soups are B. 250 – 300. However, the meat choices are exemplary with striploin, ribeye, tenderloin, and on the bone. All dry aged and three different choices with each section and something I had not seen before – a lamb tomahawk. We dined with their new MarCom lady Manager Juttyapand Rojnchinnont (Poo) and the Executive Sous Chef Amorn Precha­wathanawong (Jacky) in attendance and began with US West Coast oysters from Graham Point, Washington State. These were sweet like French but much more ‘meaty’. A great start. Oysters all the way from the USA. Next it was Jacky’s turn to prepare steak tartare at the table. This was accompanied by herbal fries. I love theatre. Food should be fun as well as sustenance. More nibbles arrived with an avocado toast with hazelnut, smoked salmon (from their own smoker) and roast beef slices. Almost a meal in itself. A dish seen very infrequently, but very popular at our table was the charred bone marrow with beef cheek, caramelized onions, salt flakes, and homemade potato crisps. Next was a New England clam chowder served in cast iron ramekins at the table. Smooth and nourishing. After a change to the house red we dined on both a Charlolais beef tomahawk and the lamb tomahawk with a baby chicken and BBQ snowfish baked in Hawaiian sea salt, and pink peppercorns. This was more than a dinner. This was an event! The evening was like a Chaîne des Rôtisseurs dinner, just excellent in every way. Wonderful for that special occasion (every day)! Mövenpick Siam Hotel Na Jomtien Pattaya, 55 Moo 2, Sukhumvit Rd Km156.5 Na Jomtien, telephone +66 33 078 888, www.movenpick.com/pattaya, T55 open from 6 p.m. until 11 p.m., secure parking in the hotel grounds.